Rome | The Old Adam Lives! Words actually mean things. Listen in and you’ll catch my drift. Thanks to White-Horse-Inn-org, and thanks to flickr and Will S., for the photo. Good stuff there on how the Roman Catholic Church and Pope Benedict are working towards unity with Protestants and Lutherans. There was much at stake then. And there is much at stake now. 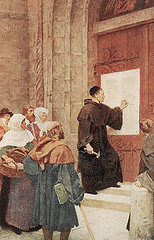 Listen in to Pastor Mark’s sermon today that ties in very nicely to this issue of Martin Luther speaking out for the freedom of the Christian, and the freedom of God to save real sinners and to work His will in our lives, apart from religious spirituality projects that are foisted upon us by the church…or by ourselves. Thanks to http://www.internetmonk.com/ for their blog post. Thanks to flickr and honecr5, for the photo.